Last week we had the wonderful opportunity to meet with Jake Greenspan, the son of the late and great Dr. Stanley Greenspan. 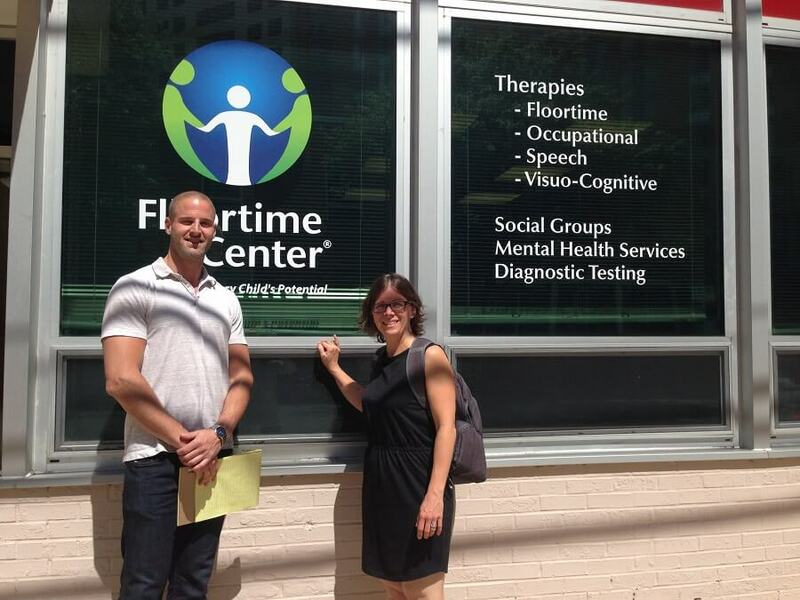 Dr. Greenspan’s protégés, Jake Greenspan and Tim Bleecker practice The Greenspan Floortime Approach® at the The Floortime Center® in Bethesda, Maryland. What a treat to be there and hear Jake’s perspective on our son’s development! As we listened to Jake’s feedback while we played with our son, I realized that I have heard these words before in his father’s books and in his father’s radio shows I’ve listened to. It was very gratifying to hear these principles being applied to our own child and to our personal experience. Here are our ten take-aways from our visit, in no particular order. It is our hope that you will find these tips helpful with your own children or the children you work with. Since most Floortime programs start with an understanding of the sensory profile of a child, there is often emphasis placed on setting up a sensory integration program with an occupational therapy to provide a child with a daily sensory diet. This has been the case with our son as well. Jake reminded us that emotion must be the driver behind the sensory work. There needs to be constant co-regulation where there is a back-and-forth exchange between the adult and child. For example, the child is swinging while engaged in a meaningful emotional interaction. In other words, the swinging alone won’t cut it. For example, during his sensory work, our son could communicate together with his occupational therapist (O.T.) to set up a fun activity based on his interest. They might combine a motor activity of building a block tower with the swinging to start. Next, the emotional interaction might be pretending what the swing is and where the plane is flying to or discussing how high or fast the swing should move to knock over the tower. I took this to mean that his emotional work together with his sensory work helps regulate his sensory system. At his developmental level, our son can socially problem-solve with us to anticipate what will happen next, how he will knock the tower over next, what he will build next to knock over, etc. like in the example above. This allows us to keep a constant exchange of meaningful, emotionally-driven interactions between us. ‘Following the lead’ is a Floortime phrase that can often be misunderstood. If your child is distractible due to his/her sensory profile or challenges with motor planning and sequencing, (s)he might wander from activity to activity. But following your child’s lead doesn’t mean just going from one activity to another with him/her. In our son’s case, he initially showed great interest in a giant ball, so Dad followed his lead and grabbed the ball. He engaged and interacted with Dad around this ball for a few exchanges but then wandered over to the slide. At this point, you might decide to follow him over to the slide and engage there, but Jake gave us a different suggestion. Jake pointed out that our son likely didn’t lose interest in the giant ball. He just didn’t know what to do next due to motor planning challenges, so he left the exchange between he and Dad. Here is where Jake encouraged Dad to entice him back to his original activity around the giant ball. This would help our son re-engage and decrease his pattern of distraction or fragmentation. Jake encouraged Dad to use high affect and do something with the ball that would capture our son’s attention and interest. Dad decided to throw the ball up next to the other smaller ball that was up on the ledge. This got our son’s attention and he was back in an instant, ready to play again. Here we will continue with our example of the giant ball and the smaller ball. Due to our son’s difficulty in planning the next step or activity, Dad enticed him back to the giant ball to find another step. Our goal is for the child to initiate the new step, but we can scaffold this for the child. Here Jake encouraged Dad to slow it down and pause to wait for a response. Jake reminded us that we want to have a rhythm of offering 1-2 things, then pausing and waiting for a response. This is also sometimes referred to as reciprocity. In other words, we don’t want to be doing all the talking and action. Dad asked if our son wanted the big ball or the smaller ball. He answered with confidence, “big ball”! In play, we want to comment on what we’re doing rather than question or direct the child. We’ve wrote about this a few times before: how a lot of questions might provoke anxiety or interrupt the flow of an interaction. Commenting takes the pressure off and can promote that process of thinking and wondering about what we are commenting about. Jake suggested to us that if we ask questions, we want them to be about giving the child the opportunity to initiate a response. That means it’s not a yes or no answer or something we know the answer to. For example, Dad had asked our son if he wanted the big ball or the smaller ball so our son could initiate a response of what he desired. Following up on the last point, Jake told us that when we give our child more opportunities to initiate responses, he will be getting a lot of practice in responding with confidence. The more he can do this, the more likely he will initiate his own ideas, which is the ultimate goal. So by giving our son the opportunity to choose between two or more responses more often, we are scaffolding his capacity to express his ideas to us. When our son was still at an earlier developmental capacity, I recall hearing Dr. Greenspan suggest putting a silly response as the second choice to avoid the issue of children who just repeat what you said last. It reminded me how far our son has come along. He can really process and answer many types of questions now–a skill that fits into functional emotional developmental capacity (FEDC 6). He is now quite capable of understanding many types of questions and responding with confidence, yet he is often hesitant to offer his own ideas or answer open-ended questions. So for us, this is something we will try out in the next while: Avoid too many open-ended questions and instead comment when appropriate, or use multiple-choice questions when encouraging him to initiate a response. I love this one because it is so in line with what developmentalist Dr. Gordon Neufeld discusses in his many parenting courses about seeing our children through a different lens. Our son went through the phases of knocking stuff over, experimenting with hitting and kicking, and is now licking us. These could be seen as ways to seek attention, but developmentalists know better! Jake’s phrase refers to a child’s need for rich emotional interaction. Some children just need more than others. When children enjoy ‘getting a rise’ out of someone, they like the emotional response they get. We, then, need to show them more constructive ways of getting that rich emotional feedback from us. The way to do this is through scheduled Floortime sessions. This is a very proactive way to provide a child with the emotional interactions they seek. Scheduling numerous 20- to 30-minute Floortime sessions throughout the day ‘feeds the child’ before (s)he gets hungry, so-to-speak. Dr. Neufeld would call this satiating the child’s attachment hunger. Regularly providing our son with all of that emotional feedback and responsiveness, he will not resort to having to get responses in maladaptive ways. It’s all about dosage. Some children will need less, some more. Some will need more when they are sick or under more stress while at other times they will need less. We will have to determine this as we go, and I will blog about it! So Jake reiterated to us how important it is for each of us to schedule in at least one 30-minute Floortime session each day, as best we can. Jake also mentioned that just hearing Mommy or Daddy’s voice targets the emotional brain and these sessions will encourage neurological growth, even if they don’t go well. He said that as parents, we can make exponential progress way more than any other practitioner can with our child. Jake reminded us of the three types of Floortime in The Greenspan Floortime Approach®: Sensory play is modulation play, experimenting with the senses such as twirling, rolling or bouncing. Object-based play is using objects to move around in space (throwing/hiding/rolling them, placing them up on shelves, climbing up to get them). Symbolic play is abstract and imaginary play. Our son is in object play and has been for quite some time. Jake said that in order to make the jump cognitively and language-wise, etc. into symbolic play we don’t want to pull our son up there, we want to nudge him. We were given the same advice from our DIR/Floortime® practitioner at A Total Approach earlier this year over March break. Jake said that if we just follow our son’s lead we won’t get into the pretend/abstract world because he’s not playing symbolically yet. He is still in the concrete/physical world. We have tried to introduce stuffed animals and characters over the past two years, but our son shows no interest. He will just throw them and sometimes protest as well. Jake suggested using first-person language such as “I’m going to get the ball” then act it out as a fish, for instance saying, “I’m going to get the ball!” The fish tries to fly to the ball, eat the ball, etc. The important part of his cognitive development will be to add the abstract part to his play. When the practitioner at A Total Approach started this in March, our son first protested, but the next time tolerated it. Jake assured us that even if met with protest, we simply acknowledge the protest and back off. At first there’s an aversion but the next time, maybe that new idea becomes part of his new repertoire and we continue to expand on it as he allows. We expand by bringing a challenge into our play. Instead of leaning our child toward doing something a certain way, we challenge him to respond in a certain way–a symbolic way in our specific case with our son and where he’s at developmentally. So, the turtle will get in his way on the swing instead of Mommy (i.e., playful obstruction). If he protests, we acknowledge it. He doesn’t have to accept our new idea, but he has to come up with his own new idea. If he says “No!” to going on the slide, for instance, I can say “But I already did the slide, where else can I go?” He can say “Go in the house” instead of repeating the same thing over and over. This will spark a new kind of imagination and creativity. In our case, Jake suggested a good place to start is with places. For instance, our son loves trains. We can drive his trains to new places since this is more concrete and not too different. We might move to characters later. The main point is that we want to make what we are expanding on fun so he will be excited to join in the fun with us. Once he comes, we can watch how he responds. Our son was mildly interested and kept checking in on me. “I think Nanny & Grandpa’s is on top of the slide! I’m driving up the ladder!” This got him interested so much that he came to the slide to see what I was doing, so I said, “Oh thank you! You’re bringing me more shapes for Nanny & Grandpa! I see them at the bottom of the slide! Here I go!” and I slid my train down the slide. He loved this! He copied and slid his train too. Jake coached me to continue so I made “Choo choo” noises and said “I’m driving up the slide again!” and then slid the train down the slide where it landed under a pile of other soft toys. Our son was there looking for it so I asked “Where did it go?” and waited for his response (PAUSE AND WAIT). He found it and handed it to me so I continued. Jake pointed out that I went back up the slide to re-engage him then when he engages I need to pause to get that interaction and slow down. Next, I went back up the slide but this time Jake encouraged me to do it differently so I drove up the ladder instead (EXPAND). The next time I said, “Now I’m going on the swing! I wanna go on the swing! I’m going on the swing!” Our son exclaimed, “No!” so I paused and said “No? Where am I going to go?” He responded, “Back to the slide!” Jake said we don’t want to just do the same pattern again to reinforce the same thing instead of expansion, so I need to do something different. I went under the ladder of the slide instead. Although his natural knee-jerk response was to yell “No!” at something new, it’s not necessarily that he doesn’t want to do it. Jake said he would rather him be negative when we do something new than do the same thing over and over. He acknowledged that the thing I did that helped him but was tough for him is that I used the trains which he likes… but in a new way. I initiated the new location for the trains but it was his idea to use trains. We are getting him to expand. We had to do a little bit to get a lot more out of him. If we sit back and wait for him to expand, we end up with distractibility and fragmentation so we have to keep him involved to show him things can be expanded in new ways. All in all we used trains on the tracks, then on the slide, then on the ladder. So the trains don’t just have to stay on the tracks. Jake pointed out that this can lead to trains having a family, and any other possibilities into the abstract. Jake also pointed out how many more rich back-and-forth interactions he saw during that session, how much longer our son sustained that interaction with me, and how we kept with the activity of trains, but expanding on it for a good length of time. This is just one very basic example, but he encouraged me to do this kind of session daily with our son, and to always make it fun. The clip below is a video of Jake Greenspan discussing the model of The Learning Tree, which was also the topic of Dr. Stanley Greenspan’s last book. Our son has modulation and processing challenges which are constrictions in the roots. Despite his capacities in each of the first six functional emotional developmental milestones, he can only achieve the capacities within a certain comfort zone with familiar people and things. This makes his tree trunk narrow. By working on expanding our son’s emotional range and creative/abstract thinking we can expand the trunk of the tree. It’s there. If he’s highly interested, that will hit the peak of his cognitive abilities. So by working in that peak zone as often as we can, we will continue to expand that comfort zone to a new, broader comfort zone. For more information about Jake Greenspan and The Greenspan Floortime Approach®, please see The Floortime Manual™ or visit The Floortime Center‘s website. Thank you, Keith. This is a great addition to the blog post and not only welcomed, but much appreciated as we, parents, as well as others all learn from experienced practitioners like you. Based on your comments I think you will like (and maybe have more feedback about) tomorrow’s already recorded ‘vlog’ (video blog) post! Stay tuned! Very helpful! I’m totally new to this and my son is 19 years old, so I can use any and all the help I can get, especially whatever advice there is for applying floortime to young adults on the spectrum. Please check our EVENTS tab for the parent support drop in that you might find helpful. You can still register for Dec 10th & 17th session!